Up to 40% Off Selected Footwear at Cotswold Outdoor Discover the huge range of outdoor shoes at Cotswold Outdoor. 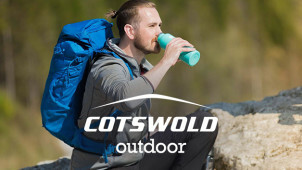 Free Shipping on Orders Over £30 at Cotswold Outdoor Why pay for delivery when you don't have to? New Season Clothing & Accessories From £30 at Cotswold Outdoor As the weather turns, its the perfect time to start getting outside. Head to Cotswold Outdoor to make sure you're prepared for it. Up to 20% Off Garmin Accessories at Cotswold Outdoor Check out Garmin at Cotswold Outdoors, get up to 20% discount. 25% Off Selected Camping Equipment at Cotswold Outdoor Perfect for a getaway this summer, check out the sale on camping equipment. Up to £50 Off Selected Women's Trousers at Cotswold Outdoor Perfect for getting outdoors in all weathers, check out the sale at Cotswold Outdoor now. Up to £65 Off Footwear in the Sale at Cotswold Outdoor Get the proper support you need as you head outdoors, now with up to £65 off! Free Express Delivery on Orders Over £100 at Cotswold Outdoor Need your order ASAP? Get free express delivery on orders over £100 at Cotswold Outdoor. Up to 50% Off Children's Clearance Items at Cotswold Outdoor Get the kids outside this spring with great savings to be had in the Clearance sale. Up to 70% Off Women's Sale Items at Cotswold Outdoor All your outdoor needs covered, now with up to 70% off. If you know that your heart belongs in the wild, if you hear the calls from the hills, or simply have a touch of wanderlust - a visit to Cotswold Outdoor will provide you with everything you that need to fuel your passion for the great outdoors. Climbers, walkers, skiers and trailblazers can fill their backpacks with all the essentials in one place, knowing that the gear purchased using a Cotswold Outdoor voucher code is not only reliable, but great value for money too. Now every adventure is bound to be more comfortable, efficient and above all more exciting. Share your love of what’s beyond the garden gate with the Cotswold Outdoor team and become part of a community of adventurers! With stylish performance gear plus quality camping equipment and accessories like tents, sleeping bags, gas stoves and more - now you can embark on daily adventures and embrace what the countryside really has to offer. Whoever you go with and whatever your experience you have in the field, you'll learn from the experts when you stick with Cotswold Outdoor. How do I use my Cotswold Outdoor promotional code? Your discounts will be deducted from your order total straight away! Check out the Rock Bottom Offers page for amazing Sales and discounts across all of your favourite categories. When is the Cotswold Outdoor sale? You can always find offers on the Rock Bottom page at Cotswold Outdoors and to get ahead of the game you could become a member with the Explore More scheme. Here you'll be the first to know about fantastic money saving discounts and enjoy other perks that'll let you get more from what you love to do. Do Cotswold Outdoor do student discount? As partners with NUS, students can enjoy 10% off at Cotswold Outdoors instore and online. You can also go instore for free boot fitting, rucksack fitting, general travel tips and more so that you can take on adventures feeling confident and prepared. For the adventure seekers and green country lovers, Cotswold Outdoor is one shop to inspire and support all of your outdoor trips. With a Cotswold Outdoor discount code from vouchercloud you can invest in quality gear and innovative accessories for less, so that you get more from your excursions and ultimately from your outdoor experience. With goods to help the whole family top their performance - this is where the fun begins. Cotswold Outdoor works with many different outdoor groups to help support the outdoor community. Groups include the National Trust, The Scout Associations and many more; this partnership provides all members with kit talks, discounts, access to informative lectures and everything else to help them achieve their outdoor goals. Discover more to get involved this year and see just why this is so important. We love a pair of sandals. We don't mean flimpsy flip flops for the beach, we're talking about robust Cotswold Outdoors women's sandals, men's sandals and shoes for kids too. Perfect for letting your feet breathe, you'll find top branded sandals that offer stability and comfort. Now you can perform on every walk, simply shop with a Cotswold Outdoor voucher to save on funky designs which will provide you with comfort in every step you take. Whether you head out solo or with the whole family, with the right footwear, you can embrace those challenges!